Through frank discussions with her medical doctors, psychiatrist, physicist father, artist mother, schizophrenic sister, and good friends, Kasia exposes her fears, longings, and hopes. She challenges her body with risky rock climbs, rigorous swims, vertical ski slopes. She speaks in an articulate, angry, and determined voice. She swims and swims. She finds solace in art and nature, vindication in the law, spiritualism in music, and a sense of control in filmmaking and mastering the violin. 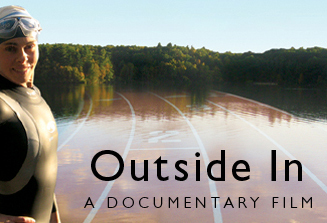 Outside In was filmed over nine years and draws from 170 hours of footage, film clips, home movies, still photos, artwork, and clippings. Enhanced by multi-layered imagery, artistic elements, and a music score as complex as the film’s subject, Outside In reflects the nature and rhythms of a fascinating individual from the “outside in.” Viewers are left with fresh thoughts and feelings about healing, identity, and their own way of life, guided by the wisdom of Henry David Thoreau: You must live in the present, launch yourself on every wave, find your eternity in each moment.